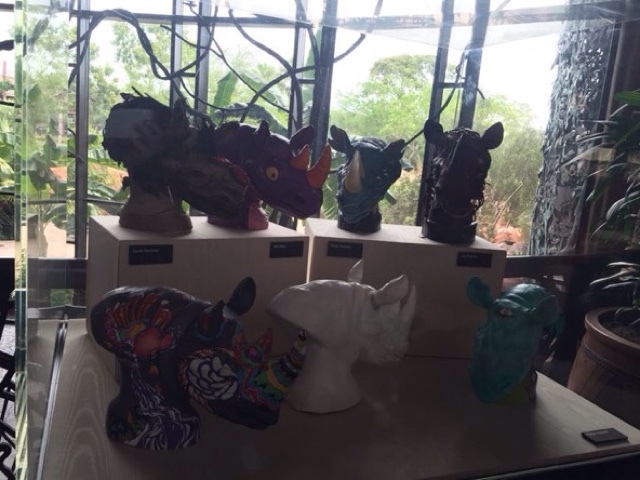 First of all, a big thanks to Cassie (@DoleWhipSwirl) for the pictures of the sculptures in the Jambo House lobby. And what, you might ask, are these fun rhino heads. 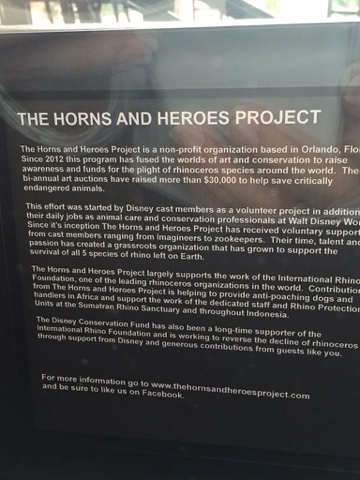 They are the work of an incredible conservation group called the Horns and Heroes Project. This group is trying to raise awareness and money for the five critically endangered rhino species that we still have left on the planet. And they do it through art work like you see here. Some of these sculptures are whimsical and others more dramatic or realistic. 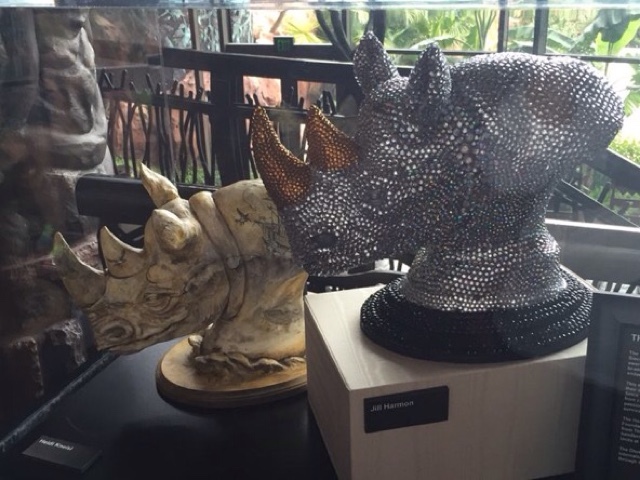 But they are part of an auction that is coming in mid September in an attempt to raise awareness of the plight of the rhino. I'm sure many of you are aware just how dire the situation is. There are only 5 species of rhinoceros left on Earth: the White and Black species in Africa, and in Asia there is the Greater One Horned, the Javan and the Sumatran. The latter two species can only be found in small pockets on rain forest and critically endangered. 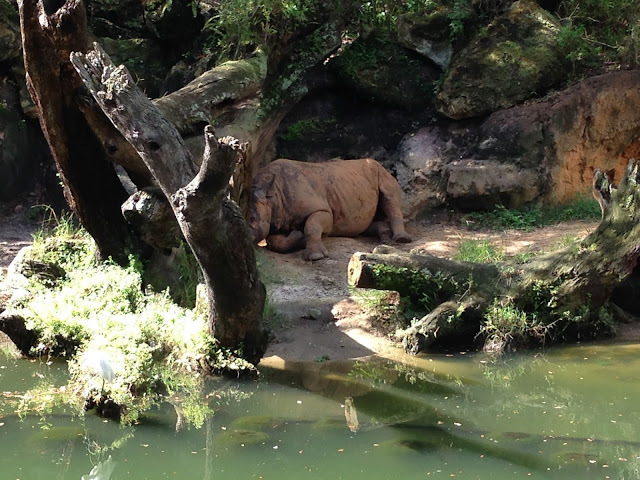 The white rhinos above, are of the southern subspecies. There are only 3 Northern White rhinos left on Earth. Pretty soon they will all be gone. And this terrible scenario, as well as the plight of all species of the rhino, is attributed to poaching for the distinctive horn. In attempt to raise money, the Horns and Heroes project is producing beautiful art work. You can see more about them in the plague below, and see the relationship this fantastic group has with Disney. 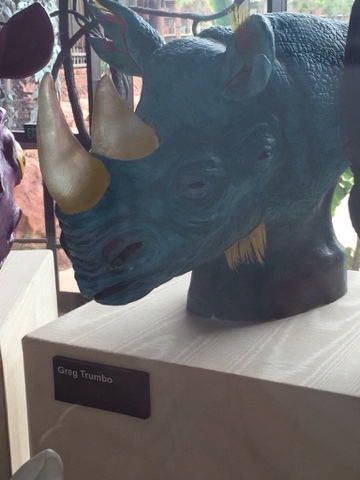 Even Joe Rohde himself donated a very tribal looking rhino to the cause. 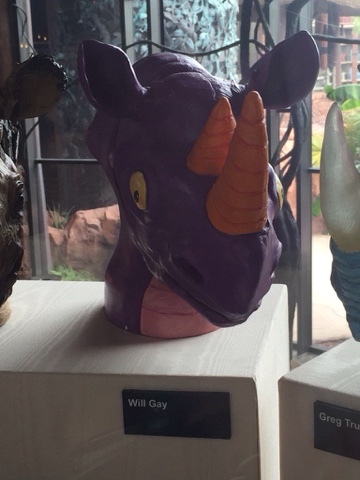 The rhino is a personal favorite. These prehistoric looking animals are impressive to see, especially up close. 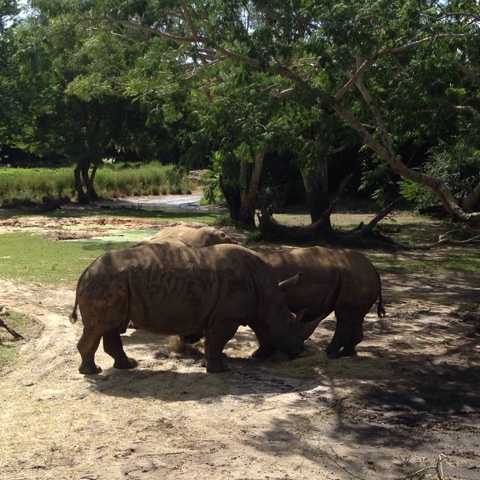 At the Animal Kingdom, you can see both the white (above) and black (below) species of rhino. Groups like the Horns and Heroes project are trying to ensure that we will continue to be able to see these animals in the wild. 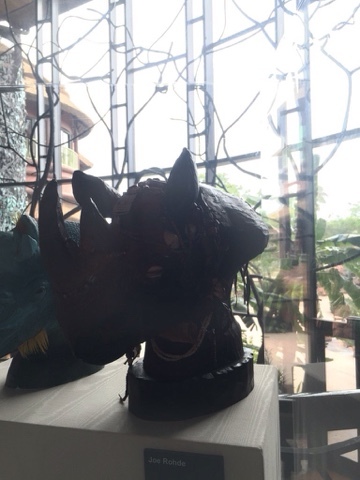 Check out the display at the Jambo House, and better yet, participate in the auction. The display will be there through the week of September 18th. A show featuring the art work from the project will be held at the Abbey in Orlando on September 22, 2016. 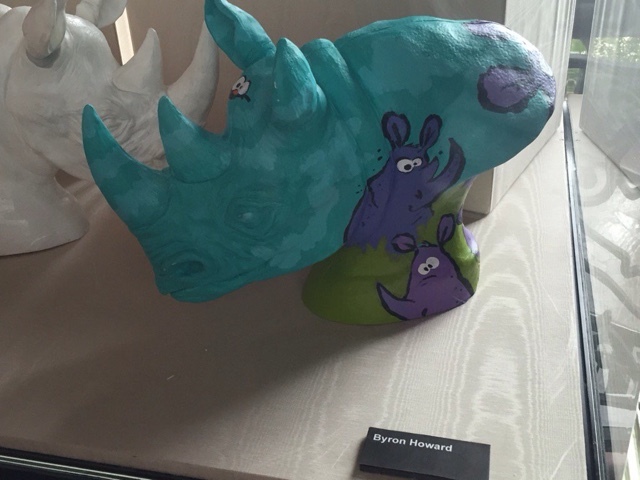 The proceeds will benefit the International Rhino Foundation. 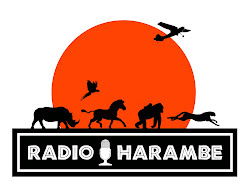 I also encourage you to look at their website and follow them on all sorts of social media outlets. 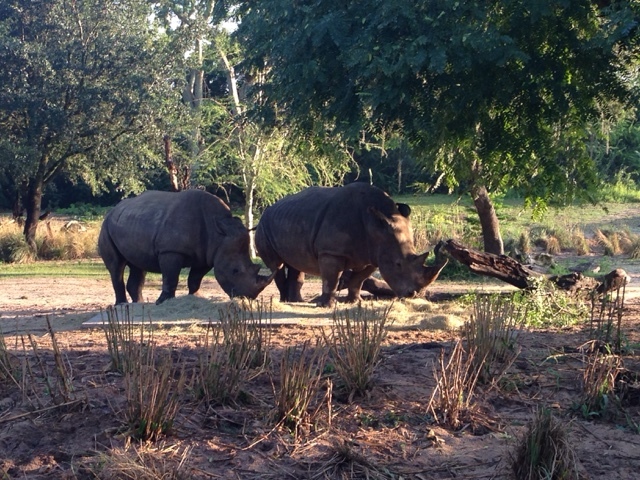 There are other great organizations like our conservation partner, Save the Rhino, that can use support. And thanks again, to our friend, Cassie for the photos at the Jambo House lobby.